Delicious and easy to make. The health benefits are an added bonus! I’m seeing a chicken theme here. I do eat other things, really! 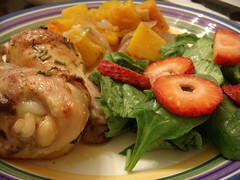 But for .69/pound (.20 off per pound), I got a roasting whole chicken and looked for something to do with it that would be at least a little different than the other birds that have fallen on my plate recently. I did a rub and wrapped it up in plastic last night and checked the potatoes. They felt neglected and started to expand their family by growing. But it’s not that hard to pop out the eyes — how barbaric sounding! — and make some mashed potatoes. De-eyed, peeled, cubed, boiled some Yukons. I guess I should have realized by their low price (.80/pound) that they weren’t going to be much longer for this world. The chicken left some liquid in its pan, so I whipped up gravy (I use cornstarch). 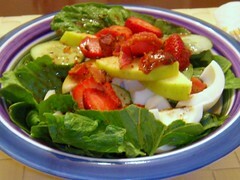 Leftover boiled eggs (white only), tomato, romaine, cucumber, celery and Good Seasonings Light Greek Vinaigrette. I stopped off at Walgreens and Food Lion on the way home. Walgreens to buy the non-food items to see if I really do save. That and they have the eye drops I need for my Lasik healing. I then went to Food Lion to wander the aisles a little but mainly went to pick up mushrooms and bacon for a recipe I saw. I looked in the organic section to see what was available and how much it’d kill my budget. The local farmers markets aren’t open all the time yet nor are they stocked with all I need, of course. Boy were those prices high! But, I focused on the “dirty dozen” to get the most green benefit from my green. I picked up a few organic apples. While there, I stopped off to look at one of my latest addictions: strawberries. They were cleaned out. Seems they’re having an unadvertised special on strawberries for 1.33 a pound. Yep. That’s dirt cheap. But then again, strawberries are one of the “dirty dozen” so I hesitate to buy too many “dirt cheap” strawberries. 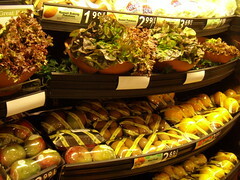 I, at least, try to buy ones grown and processed in U.S.A. Since they were out and I already had a little tub in the fridge, I didn’t pick any up. I wanted to use up the strawberries I do have so that I can buy more (and maybe check out one of those you-pick farms). I don’t have much time before I leave for Orlando for a week so want to clean up all the produce in the fridge. That’s really all I can figure to call it. I had some produce in the fridge that I needed to either eat or throw away and I hate to throw stuff away. I sliced up a golden delicious apple, a hot house seedless cucumber (I love those cause I don’t have to peel them), romaine, spinach, boiled egg (only the white part), strawberries, and bacon (center cut). 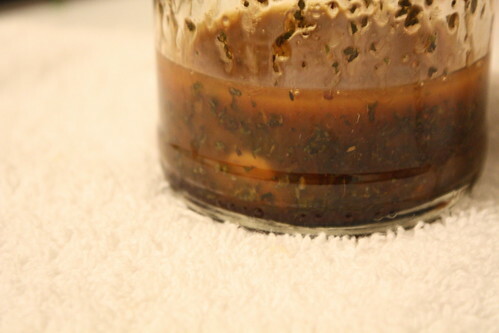 I drizzled it with about 3 tablespoons (I measured to see how much dressing I use to count points) of Newman’s Own Light Balsamic Dressing. Thoughts: Well, while I knew apple, spinach and strawberries would do well with balsamic, I didn’t like when I’d get a combination bite of strawberry and egg. So, I basically had two salads. I thought the egg, spinach, romaine, bacon combination was fantastic as seen in that recipe. 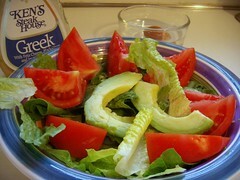 I also liked the combination of strawberry, apple, spinach, romaine, and balsamic. The cucumber didn’t do much except blend into the spinach. Update: I broke down and walked to Food Lion today to get some strawberries. They are from U.S.A. but not many left for $1.33. 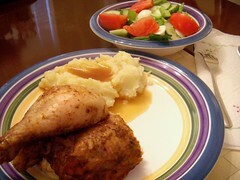 In my effort to try and live mo’ bettah, I cooked last night and tonight. It’s hard though. I get off work around 5:30 or 6:00 p.m. Commute is not long but still puts me in the kitchen around 6:00 – 6:15 p.m. usually. Then there’s prep and cooking, so I’m not eating till around 7:00 p.m. or so. I want to exercise when I get home but if I did that, then I wouldn’t eat till closer to 8:00 p.m. Insane. Oh and another thing about eating last is the craptastic light I have to work with if I do photograph. I apologize for the blur. Used up the rest of the drumsticks that were dirt cheap that I bought yesterday. Didn’t use my locally bought honey because I didn’t have enough but will next time. I did use my own grown chives from out back instead of green onions. Measurements were eyeballed but used basically the rest of the recipe sort of. You know how it is. This was a mixture of torn romaine lettuce, baby spinach and sliced strawberries. They’re in season, y’know. 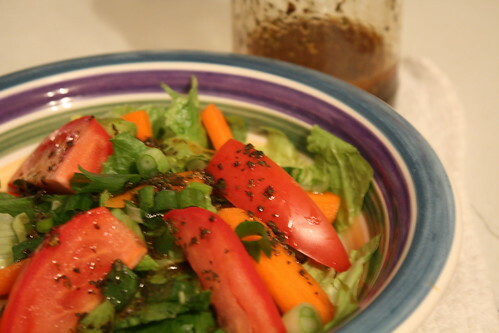 I drizzled on top of it some bottled Light Balsamic Dressing (Newman’s Own). This was my first time making or eating a strawberry salad and I liked it. Next time maybe I’ll add nuts.